On May 8th, the LVE team in Cambodia did a half-day session with the Department of School Health of the Ministry of Education Youth and Sports of Cambodia. The presentation included an introduction to LVE, two experiential games on cooperation and humility, and personal values. 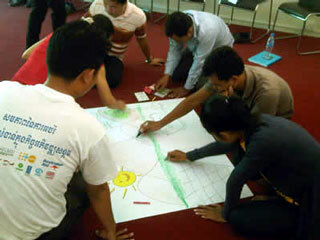 There were 20 participants from the department and two participants from IMPACT Cambodia. The LVE Team in Cambodia, led by Chamroeun Chim, was joined by Anne Waltham from the United Kingdom in conducting two two-day LVE Workshops in January 2015. The first was for 30 educators and the second was for 30 people from the Ministry of Education. The Under Secretary of State for Cambodia also graced the training with her presence and participation. It provided a wonderful opportunity for people to reflect on the importance of values and the benefits of values education for individuals and the society. Chamroeun Chim, an LVE trainer from Cambodia, shared the following: “An LVE Workshop was held for 25 first-year university students of PEPY Cambodia, an organisation working with youth empowerment and education on May 15th, 2014. 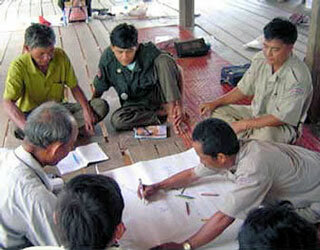 The one-day workshop on Peace, Respect, and Love was conducted in Siem Reap province. The students were involved in a variety of activities, such as values awareness, mind-maps on respect and the tunnel of love. Participants expressed positive feelings towards values reflection and the positive messages by their peers. On the 15 of May 2014, an LVE Workshop was held for about 25 first-year university students of PEPY Cambodia, an organisation working with youth empowerment and education. The one-day workshop on Peace, Respect, and Love was conducted in Siem Reap province where the students and organisation are based. The students were involved in a variety of activities, such as values awareness, mind-maps on respect and the tunnel of love. Participants expressed positive feelings towards values reflection and the positive messages by their peers (the tunnel of love. A two-day LVE training for Educators was conducted on the 15th and 16th of June 2013 in Phnom Penh. There were 8 participants: 5 of whom were from two different schools, two were from NGOs, and another participant was from a private company. The training focused on peace, emotions and best-teaching practices. Participants who were educators had the chance to prepare and teach a topic of their choice, among the participants. In 2011, two of our LVE trainers, Qudy and Huy, conducted a two-day training with 20 women at IMPACT Cambodia's office which is about 30-minute ride to the south of Phnom Penh. The participants were health volunteers from villages in which IMPACT Cambodia works. Forty participants from all different backgrounds, mostly NGOs, joined in the two day TTE – teachers from community centers, children’s centres, public school teachers, orphanages, the International Labor Organization, Art Center, Yoga Center, etc. There were five from one organization, eight from another, so it was quite easy to create a happy and harmonious training group as they were all excited and happy to be together with people from other NGOs. Everyone was engaged and the energy was high all the time. Chamroeun and Qudy conducted the program together and the feedback from the Café was that all they heard for two days was laughing. The Nataraja Yoga Center, sent 2 girls training to be yoga teachers. These girls come from abusive backgrounds and are learning that yoga is not just an exercise but a lifestyle and self esteem and values are very much a part of their training. "Ly Ya told the team about some games she learned which she is already integrating into her kids yoga classes. I asked them what Values meant and the next three days were spent in group discussion was about self-worth and self-esteem. Ly Ya, who has grown up in extremely poor circumstances and amidst violence and violation that I cannot even conceive of, talked at length about the idea that her life is worth something and what it feels like to believe in yourself. She expressed very clearly how her behaviour in the world and towards others can be very destructive when she hates herself, and now that she has a sense of self-worth, she wants to share with others and she feels good about what she can do in the world. Ly Ya was amazingly articulate and insightful about where she had been in her mind, and spoke so openly and freely to the group about issues that I did not even know she still struggled with. It was truly an amazing breakthrough. I think much of it had to do with the content of the course that gave Ly Ya a vocabulary she could use to understand and articulate her experiences, and also she found out how warm and loving everyone was." Another training was followed by a TTE from March 24 & 25 followed on by a TTT from March 26 to 28, 2010. Malaysia graciously flew into Siem Reap to help facilitate the TTT. However due to an urgent need to unexpectedly return, Qudy and Cham had the opportunity to develop the courage to continue with the well-started TTT. Needless to say, both trainings went extremely well and out of the 12 trained in our TTT, we now have a few more trainers to help with the next training already scheduled for May 14-16. This time we have trainees coming from Poipet, a border town where children are extremely vulnerable to trafficking and a lot of abuse. We are so pleased to welcome them to our next training. We have finally completed our first full translation of the Living Values Activities for Children Ages 8-14 book in the Khmer language (Cambodian) which has been done by our trainer, Cham. All of this has been possible through the generous support of a woman from Poland who has been financially supporting the LVE trainings and translation in Siem Reap for the past three years. She is not a very rich lady but she certainly has a big heart for Living Values Education. We also wish to acknowledge the Peace Cafe Values and Eco Training Centre who have been hosting and supporting these trainings. There were two follow-up LVE trainings for Preah Dak pagoda (Siem Reap province) and Pror Lay pagoda (Steung district, Kampong Thom province). Both LVE workshops were one and one-half days. 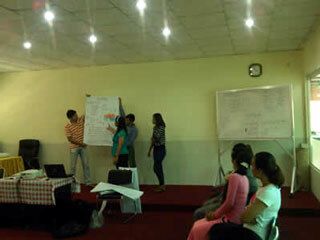 Chamroeun and Qudy facilitated the training. The training in Preah Dak Temple was on 23 and 24 September. Qudy, the Focal Point for LVE in Cambodia reports: “We did our first two days of LVE in April this year for this group. Among the 25 participants, five of them have been teaching LVE activities to children. This follow-up was aimed to give those teachers the opportunity to share their experiences and the challenges faced, as well as giving chances for most of them to practice teaching LVE activities with guided help from us. Although the space and materials for training were limited, the pagoda itself was beautiful and peaceful. It was the raining season here in Cambodia. The rain came in the afternoon of first day. The room was leaking water from the roof; we had to use two buckets!!! Participants were all young volunteer teachers from different villages around Angkor area, they were very enthusiastic in practice. Both of us were impressed by the way they engaged themselves in each lesson we assigned. They used the surrounding space as you can see from the enclosed photos Some of the activities were done under the trees when there was no rain! Cham and Qudy travelled in a taxi with cramped seats on the afternoon of the 24th. There were seven adults and one child in the taxi, plus the driver. Two were in the front seat beside the driver, with the four other adults and the child at the back seat! It was quite an experience for Qudy to Pror Lay. The guesthouse we stayed was two kilometers from Pror Lay Pagoda. Each morning two participants with motorcycles picked us up. On the second morning there was a huge rain; we were all soaked when we reached the temple. Participants during a LVE Workshop in the Kol Sla area. 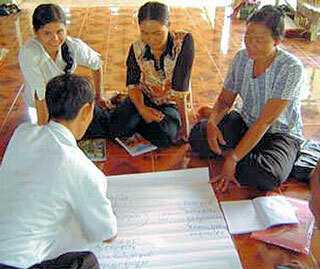 At the beginning of August 2008, a Living Values Training was held in Siem Reap, Cambodia. Thirty-one participants joined the Living Values Teacher Training at the Angkorland Hotel in Siem Reap on 2nd and 3rd of August. It was a wonderful experience of co-operation and coming together. The program was sponsored by someone living in Japan who was in Siem Reap a year ago for the last LVE training here. With this support we were able to provide a very conducive environment in the middle of the monsoon period here. Louise Solomons offered to come to Siem Reap from Wollongong, Australia, to conduct the training. She is a retired teacher and introduced LVE in her school five years ago; it is still going strong. Her husband David joined her and filmed the event as well as providing guitar backing for the songs, many of which Louise composed herself. Valerie Magniux from Phnom Penh, the LVE Coordinator for Cambodia, took the six-hour bus ride from the capitol to assist. She has been offering training in Cambodia for seven years and was a great resource. 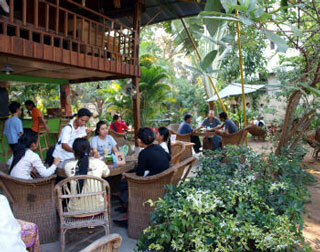 Participants came from Indonesia as well as other towns in Cambodia including Phnom Penh, Battambang and Kampong Thom. Twelve participants continued for another four days, from the 3rd to the 7th of August, at the Raja Yoga centre to complete the Train the Trainer program. This culminated in hands-on experience working withtraining children at the Green Gecko orphanage. Damnak, a Buddhist monastery. Most attending were from NGOs and it was attended by about 10 monks as well. There were three participants from HK. The training was conducted by Trish from Vietnam and Sambo from Phnom Penh. Former Khmer Rouge mind map. The local bureau of UNESCO in Phnom Penh decided to integrate the Living Values Education Program (LVEP) in their education program for the Koh Sla region, the former Khmer Rouge area which was the last one to surrender after the genocide. After more than 25 years of isolation, the area has become one of the poorest in the country. The level of illiteracy had reached an extreme. For example, in a village of 650 people, only one person can read. The deep desire of the people is to move forward as quickly as possible far from all the memories and fears connected with their involvement in the war and to live a peaceful life. But this is made difficult by the fact that the victims of the genocide often have to live in the same village as their perpetrators. Anger, fear and violence are deeply rooted as most people never really expressed their grief in a reconciliation process. The family structure has been deeply damaged and parents cannot convey a proper set of values to their children. The education system is slowly being rebuilt, yet many children still have to work as most parents don’t realize the importance of education. Participants share their reflections on values. The Organisation for Peace and Development of Cambodia (OPDC), a local partner of UNESCO, started to facilitate trainings on education for a Culture of Peace. LVEP was first introduced to more than 80 members of the local Authorities, village chiefs, commune chiefs, village supervisors, all the commune council members, local police and soldiers. The positive response from the authorities opened the doors to series of trainings conducted for 23 non-formal education teachers, literacy teachers, ECCE teachers, about 100 youth from two communes, and the monks from two pagodas. Each target group received a training in accordance with their respective role in the community. The monitoring of the trainings for teachers was very useful to assess their level of understanding of the concepts and their practical application, especially in this area without any facilities. During one year, the facilitators went to different classes and also visited people in villages, trying to understand their difficulties. It brought a warm and an encouraging feeling in villagers as they felt “people from the outside now come to help us.” Apparently this was a hopeful sign to them that they were coming out of their isolation. Teachers during an LVEP Training in Beantey Meanchey. Banteay Meanchey is a very poor area. It is a target area for child trafficking and drugs and there is a high incidence of HIV/AIDS. 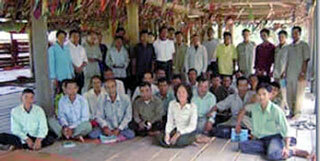 In 2005, two LVEP Educator Trainings were conducted in Banteay Meanchey at the Thai boarder. The program was launched by the Co-Governor of the Province, the Ministry of Education and the national commission of UNESCO. More than 60 teachers attended both trainings. The Living Values Team is planning to monitor a number of classes during this year, 2006, in order to encourage the teachers to integrate Living Values Activities in their regular schedule. Phnom Penh In April 2005, 15 teachers from two main High schools in Phnom Penh and Takmao received LVEP Educator Training. The first people who took benefit from the training were the families of the participants. When the facilitators met the trainees after one month of implementing LVEP at school, many of them acknowledged that this training changed their personal life. They are applying the tools of LVEP at home as well as at school. Several teachers commented about anger, saying that they don't get as angry as they used to before the LVEP Educator Training. Living Values taught them tolerance in a practical way. One day during a follow-up visit, the monitoring team assisted one teacher in solving a conflict between two boys who were fighting over a stolen piece of chalk. The children were very happy that the teacher did not beat the one who stole the chalk. They learned about respect and love instead. Some of the commune chiefs have shared their observation that since the LVE workshops gambling and domestic violence have reduced in their communes. The training for the former Khmer Rouge community leaders and head school teachers was so successful that they plan to implement with the whole community. A community of former Khmer Rouge Soldiers, men of whom had been soldiers all their life, were wonderful to work with and participated in all the creative values activities whole-heartedly. They created poems and songs on peace and danced Khmer dances while singing the songs on peace & harmony. The UNESCO person working with this community had his whole family and relatives killed by these men yet now he is so committed to helping and supporting them in their commitment to peace! - it was an incredible experience and really brought home one of the assumptions of the Living Values program; that the essence of everyone is good and that although it may become covered over by negative tendencies, the right environment and values activities can re-emerge it once more.